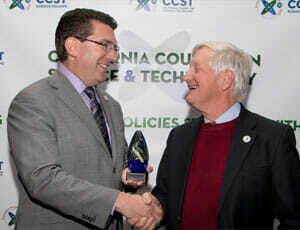 Assemblymember Jay Obernolte receiving the CCST Frontiers in Technology Policy Award from CCST Council Chair Jim Sweeney. Obernolte was one of four awardees in the inaugural CCST Leadership Awards. 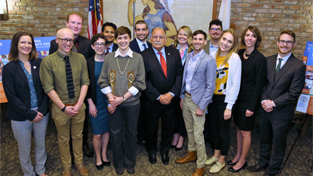 SACRAMENTO, Calif. – The 2018 S&T Week culminated in the inaugural CCST Leadership Awards and Reception – a shining night of networking and bonding as we formally introduced the 2018 Class of CCST Science Fellows to the Capitol community and unveiled the inaugural recipients of our Leadership Awards. On the night of February 21st at Cafeteria 15L in downtown Sacramento, attendees found a gala space transformed into CCST colors and the theme of “Science at Your Service”. A new, interconnected poster exhibit featuring CCST’s State Sustaining Institutions and Federal Laboratory Affiliates highlighted the incredible scientific and economic contributions of UC, Cal State, California Community Colleges, Stanford, and Caltech campuses, as well as NASA and U.S. Department of Energy National Labs. The hundred-strong crowd included legislative leaders such as Senator Ben Allen(D-Santa Monica), Senator Steven Bradford (D-Gardena), Assembly Minority Leader Brian Dahle (R-Bieber), and Assemblymember Bill Quirk PhD (D-Hayward), and staff from nearly 20 legislative offices and policy organizations, including the British Council. Also attending were CCST Board and Council Members, federal labs directors and staff, and CCST Science Fellows and alumni. The event kicked off with a few words from CCST Executive Director Susan Hackwood, who recognized CCST’s role for the last 30 years in making California’s policies stronger with science. Longtime Stanford professor and new CCST Council chair Jim Sweeney spoke about the importance of science in informing policy and his involvement with CCST over the last 20 years. 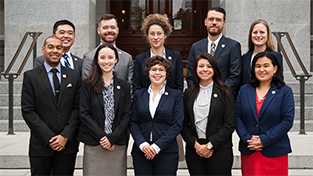 And Deputy Director Amber Mace formally introduced the 2018 CCST Science Fellows to the Capitol community. It was then onto the main event: presentation of the inaugural CCST Leadership Awards. The remainder of the evening saw fruitful conversations among leaders in science and technology from across the State of California. It was a rare yet pleasant sight – with time and hope, a more commonplace one – to find state legislators, staffers, distinguished professors and researchers, directors of NASA and DOE National Labs, STEM educators, and young Capitol professionals all united under one roof. 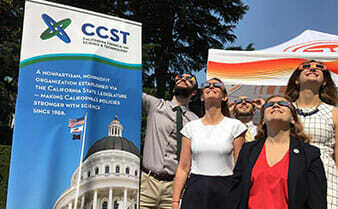 Their shared energy, dedication to public service, and collective curiosity for possibilities reaffirmed our belief that California’s policies are truly stronger with science – and that CCST must do its best to serve this community and carry on its important mission in the decades to come.